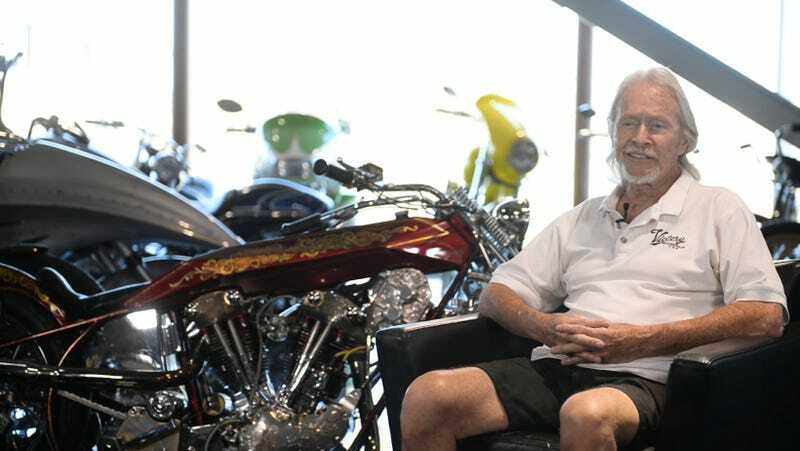 Arlen Ness was a prolific figure in the world of American cruiser motorcycle customization, dating back to 1970 when he began tweaking his own Harley-Davidson Knucklehead in his California garage. Since then he’s become one of the best known custom builders in the scene, known to some as The King of Custom Motorcycles. On Saturday, Arlen Ness Motorcycles posted the below announcement to its Facebook page stating that he had passed the previous evening among loved ones. That original Knucklehead is still in the ANM collection. Mr. Ness tweaked and changed major pieces on the bike every year so he could enter it in an annual custom bike show that didn’t allow the same bike twice. “This bike was the first custom I ever did, because I only had one bike,” Ness once said. That kind of creativity drove Ness to start his own custom motorcycle shop and parts supply company in Dublin, Calif. Since the early 1970s the business has continued on through three generations of Ness. In addition to building custom one-off motorcycles for clients, Arlen Ness Motorcyles also builds custom parts for Harley, Indian, and Victory brand motorcycles. Never quite sticking with the standard, Ness went above and beyond with his builds, creating some truly unique bikes. He rose to prominence for building custom race-inspired skinny-tube 5/8ths inch chromoly frames for his bikes, which was truly unique at the time. That first 1947 Knucklehead, called Untouchable, is a great story. Let Arlen tell you the story of the bike himself with this video. He was a bright feature in the bike world, and he will surely be missed by his friends, family, and fans. Ness is survived by his son Cory, grandson Zach (both in the family business), and his wife of 59 years, Beverly.